Welcome to all who may be new here and here's a little bit about me! I have taught special education for 3 years in a functional, life skills program with students with multiple special needs. Most of my students this past year fit into the severe and profound category. My top 3 advice for all teachers, especially special education teachers. 2. Get your classroom organized and labeled: My first couple of years I had some things organized and figured I'd get the rest done as school started. It just doesn't happen people. Find a place for everything in the beginning and students will catch on fast and suddenly everything runs so much smoother! 3. Communicate with your staff and be consistent: I'm specifically thinking about behavior plans here. Especially as special education teachers, we can tend to have a lot of staff members in our classroom. Make sure they know what is going on so that students plans can be implemented consistently. That being said, follow the behavior plan...but when something isn't working don't be afraid to switch it up and try something crazy either! 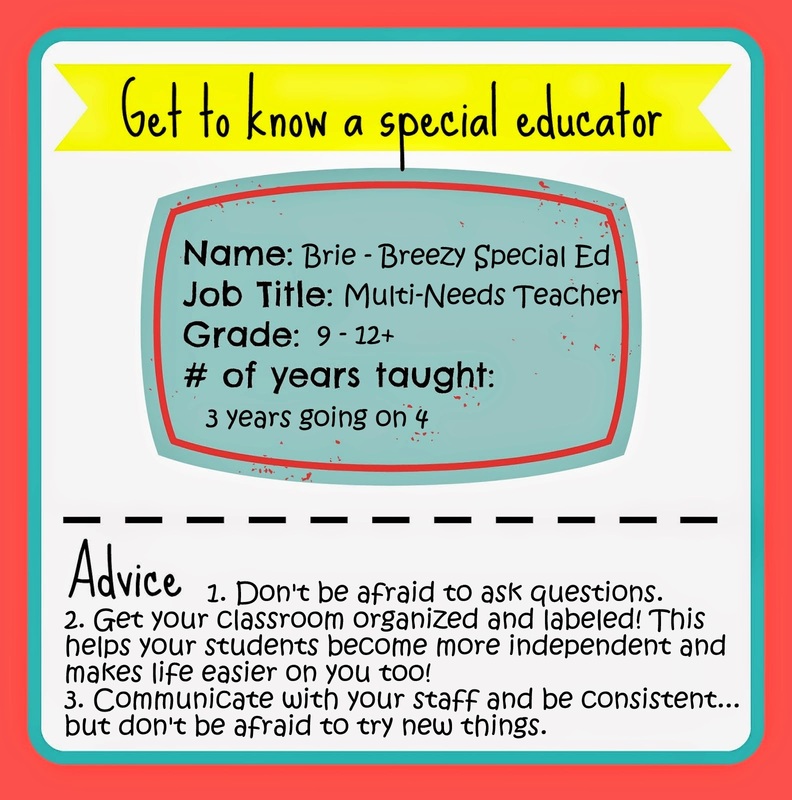 Be sure to check out the advice from other special education teachers as well! Want to stay in touch? Feel free to follow me on Facebook, TeachersPayTeachers, Pinterest, and BlogLovin! Great advice! So excited to have found you through the hop! I've been to your blog before, last year when I first started blogging, but I lost the link. Yay to be back! 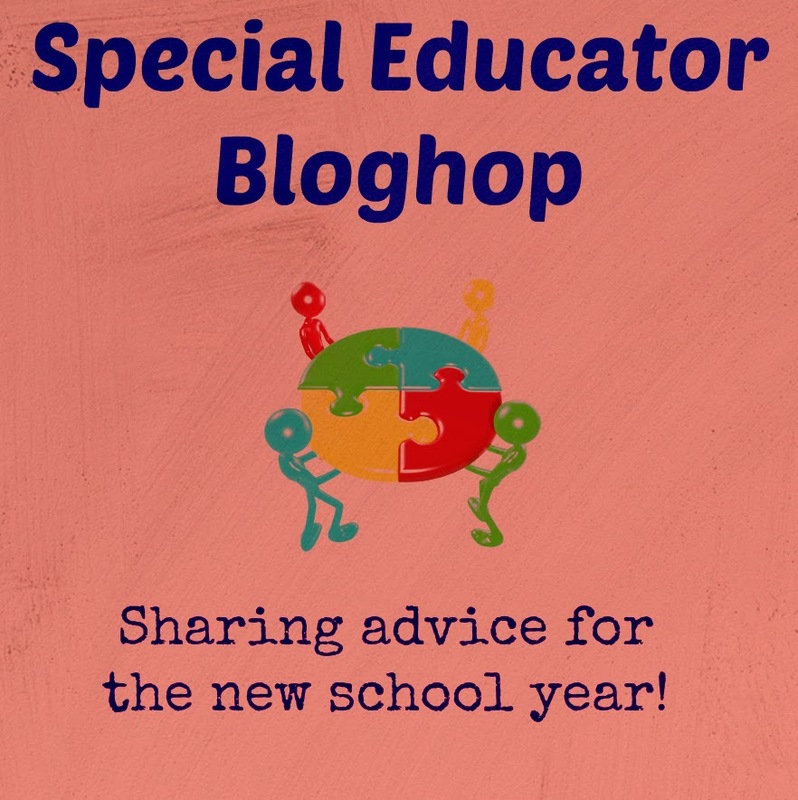 I'm glad I found you through the special ed blog hop! I found you through the blog hop! Great advice. I am still trying to work on being organized in my 5th year of teaching! I'll get there, I swear! You shared some wonderful advice! I am going back in the classroom this year after doing inclusion and my number one priority is to get as organized as I can! Thanks for stopping by my blog. Hope your year is smooth sailing! Great advice! You are so right - you never get it organized during the year. I am always reorganizing and last year I just didn't get it finished like I thought I would. Now to do it before school starts. Great advice! It's comforting to read from another teacher that it's okay that we don't always know what we are doing. We can be too hard on ourselves at times, I think. Lovely to meet you through this great blog hop and so nice to know you believe in asking for help because I think with the greater amount of children with even more special educational needs coming into my mainstream primary now I will have even more need of professional advice from others who are actually experienced and live in the real world! !